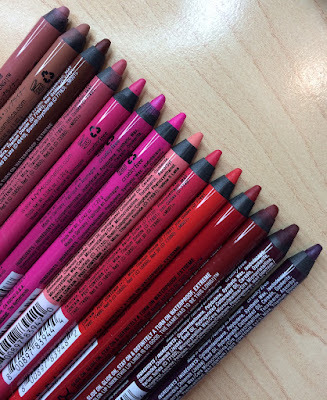 As you've seen in my recent lipstick posts, I'm testing out new products sent to me by Milani (I still have a couple more categories of lipsticks to show you), but for now I wanted to talk about eyeliner. Last June I reviewed some liquid liners from Milani called Infinite (click here for the post). They are seriously long wearing, truly waterproof liquid eyeliners. The only pain with those was that they were slightly thick in texture and took longer to dry. The brand still makes them, but has recently come out with a new kind of liquid liner called Ultrafine ($7)- it claims to also be waterproof, and has a fine felt tip. It's not necessarily finer than similar liners from other brands like Revlon Colorstay... but it's still going to give you a nice slim line. The consistency is much more like a traditional liquid liner (shake before using)- not thick like Infinite- and they dry faster. So when I got these I thought... if they are TRULY waterproof like the brand says, I'm gonna love these! This is kind of a tricky review for me to give because I don't feel the same way about every liner in this bunch. First off, only one of the liners is totally matte-- that's the one shown above called "Black Vinyl". All of the other liners have shimmer in them. From left to right: Black Vinyl, Black Gems, Prismatic Purple, Emerald Glisten, and Sparkling Turquoise. Here you can see- Black Vinyl is your typical black liner, Black Gems really is more of a charcoal shimmer, Prismatic Purple has a blue-toned shimmer, Emerald Glisten is a metallic light green, and Sparkling Turquoise has a very similar sparkle level to the green. Whether or not you would wear these is really a matter of personal preference. I've been wearing Black Vinyl a LOT because I love a nice dark line on my upper lashline and I find it to be quick and easy to apply. It also lasts like crazy (more on staying power in a minute). I'm not a big fan of shimmery charcoal liners because they just don't define the eye like a dark matte liner would. As for the colorful shades, a couple times I actually layered them with Black Vinyl... putting a thicker line of the colorful shade down first, then a fine line of black right next to the lashline. It was a pretty effect since these liners do give off very intense, opaque color. The only one that seemed the slightest bit watery or like you'd need to overlap with an extra coat was Black Gems. So the question remains... are these REALLY waterproof? It's an important question, especially when people are doing makeup for an important, potentially tearful event like a wedding or funeral. The answer to the waterproof question is yes and no for these products. In the picture below, I misted my liner swatches with water. The blue and green immediately started to run before I even touched them. Once I started rubbing on the moistened swatches, the blue and green continued to fade- not disappearing completely. The black, charcoal, and purple did not run or lose intensity. I should also note that these did not fade when I rubbed across them WITHOUT water, and when I wore them and did not come in contact with water, the shades seemed to all keep their intensity and did not peel. What do you expect out of a "waterproof" product? I expect it to not only stay, but to keep up the same intensity that it had when it was first applied. I certainly wouldn't expect it to run! While Black Vinyl, Black Gems, and Prismatic Purple meet my standards for being waterproof, Emerald Glisten and Sparkling Turquoise certainly don't. I'll continue to use Black Vinyl because I LOVE the intensity and waterproof quality, but I'll probably only get minimal use out of the rest due to color preferences (I don't use colored liquid liner all that often). These are able to be removed fairly easily with eye makeup remover, and my Olay or Equate cleansing cloths also remove them. 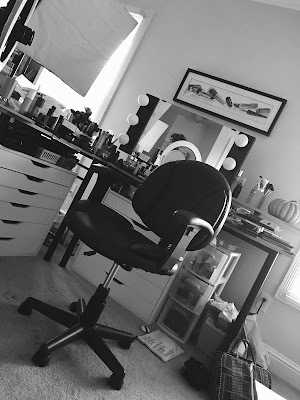 I am LOVING the Beauty Broadcast Community! Hope you'll check out the new site that includes a forum, chat, photo/video sharing, and more! :) This was the big project I've been talking about :) You can also get there from the "Community" button at the top of this page and the new icon in the sidebar. Tyler and I had so much fun at the hockey game on Friday!! St. Louis Blues won! I also saw Pitch Perfect over the weekend for the first time. SO GOOD! Thanks to everyone who recommended it. Fat Amy is so awesome! What's for dinner tonight? We're having tilapia. I can't wait to try this! I bought the Infinite liner and absolutely love the complete waterproof-ness of it but dislike that it's super thick and really dislike the brush on it. I'd end up getting it all over my lashes so I'd use a smaller eyeliner brush instead. This seems like it'd be much easier to use. Thanks! Oh my gosh, I am lusting over that purple shade! It is fantastic. I will look into the black one. I'm on the hunt for a good liquid liner. I have had mine for a while and need to replace it. We are having indian style veggie stir fry with brown rice and tofu! I am planning on ordering some Milani products, you have been talking about them so much and I am really tempted to try the eye pencils and blushes especially. These are similar in formula to the Mac Superslick, Urban Decay Liquid Liners, Mufe, Stila, etc. I'm so glad to see this formula has finally made it to drugstores! NYX has also come out with this style in their Glam Luxe line. These look so amazing! I usually don't like them in blue, but I must admit... they're looking wonderful. I tend to stay away from the rigid liquid liner applicator since they tend to skip on my crepey 40-something lash lines. From watching your previous vids, you've sold me on the WnW Mega Liner, which is a brush applicator and more easier to control over my crepiness. Thanks again for taking the time and giving a thorough review. I totally trust your reviews! Thanks for the review - I may have to pick up the black vinyl liner when my FabuLiner runs out. Also, I'm so jealous - my husband was at the Blues game on Friday night with a friend. I can believe you were there - seeing as you are Cards fan too - but this really makes me wish we could have BB meet up in St. Louis! Thanks for posting this! I've been on the look out for a good black eyeliner. So many options out there it's hard to pick one! Reality on the make a difference is usually in which H&R Stop is usually an excellent business in which people should buy at a bargain selling price. Young children and can it's really a good business because it can be generating a top fee involving give help in crosswords back on its own cash. Throughout what I'm sure will certainly be the purchase publication on the year. If you desire to have access to the first-rate songs on the go, Setbeat Setbeat iOS application on iPhone or other suitable iOS gadget. you desire to take pleasure in the application and also perform. Kodi on Android which now values "default select action" settings value. Mac PCs by utilizing BlueStacks Android emulator application. imobdro making use of the software called Android emulator. Android. Before carrying on you need to permit to Sarahah Sarahah for PC Download you have shared your ID online and you can be looked by any person. Currently, your device will have the Aptoide application symbol on it. Aptoide for Android You will certainly see a huge banner.